Outdoor learning isn't just the preserve of urban schools. These simple ideas will help you incorporate outdoor learning in a concrete jungle. Whether it’s hunting for minibeasts in the playing fields or reading a book under a tree, the positive impact of outdoor learning on young people’s achievement and development is widely acknowledged. But what do you do if your school isn’t blessed with acres of green space? 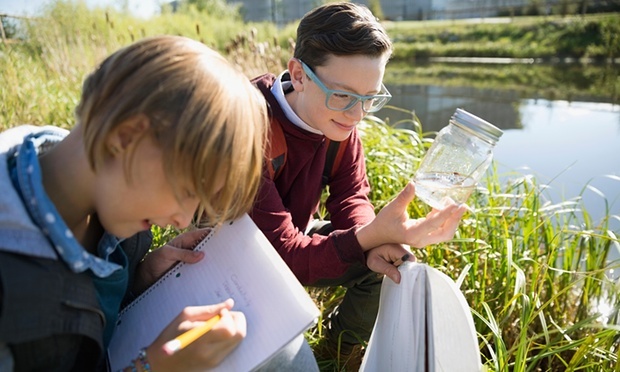 From making the most of your playground to venturing further afield, we’ve gathered five tips to help urban schools feel the benefits of taking learning outside. It could be as simple as asking students to close their eyes and tune into the sounds of the urban world. Games such as follow-my-leader or hide and seek are good for familiarising students with their outdoor space. Older pupils could map the school grounds, identifying their favourite areas and explaining their choices. One of the great things about outdoor learning is that it spans the curriculum, so you could measure the angles of outdoor structures in maths, investigate how far sounds travel in different weather in science, or use the playground as the setting for a historical re-enactment. If you’re pressed for time, plan outdoor activities for just before or after a break time. In secondary schools, arrange to meet your class at an agreed outdoor spot and for primary schools, practise getting outdoor clothes on and off quickly, and keep them in an easily accessible place such as a dressing up box. Mini wildlife gardens, which stay be outside but don’t take much space, are another good idea: bug hotels, bucket ponds and bird boxes are easy and fun to make, and children will enjoy checking to see what creatures have made their homes in them. For very small, concrete playgrounds, Natalie Johnson from The Wild Network suggests bringing in a few old logs or branches from fallen trees to encourage wildlife. For schools with a little more space, you could apply for a free school tree pack from the Woodland Trust. The pack contain 30 saplings, which would cover a space equivalent to the size of one tennis court or create an 8.5m line of hedge. Wildflowers can be grown on a scrap of land; even a small area in the middle of a city will attract wildlife. Alternatively, you could catch some bugs in outdoor pitfall traps and bring them inside for students to identify using magnifying glasses. Draw on your local community to find people who can share resources. Parents might be able to get rid of old outdoor clothing or footwear, or ask a local garden centre if they could donate plants or expertise. And don’t forget to bring the outside in with evidence of what you’ve been doing. Indoor displays could include photographs, items that pupils have gathered, and rubbings of different outdoor surfaces. Ideally you want to sit down as a team and have a think about what’s within a 10- or 20-minute walk from your school. There might be shops, a high street or even an art gallery or museum. Rather than being a one-off, outings should be a regular part of school life, involving all learners in a year-round, progressive programme that fosters an appreciation of the natural world according to Martin Smith, chair of the English Outdoor Council, an umbrella body for organisations involved in the provision of outdoor education. He adds: “See going outdoors as integral to what you do and not ‘separate’. The outdoor environment is just another resource for you to use. This could be a park, nature reserve or woodland. Discover the wildlife that lives there using hands-on activities such as pond dipping, bug hunting and nature trails. Activities run by environmental organisations such as Learning Through Landscapes, the Institute for Outdoor Learning and the John Muir Trust are particularly good. You might also want to look for the Learning Outside the Classroom quality mark or consult with a local outdoor education adviser when selecting a venue. It is worth remembering that outdoor learning experiences are more likely to be successful if you involve young people in their planning and delivery. Pupils can research venues, organise fundraising activities and get involved in any risk-benefit assessment. Another good tip is to share ideas and inspiration with like-minded teachers through local schools and networks. The London Environment Educators Forum, for example, runs events to help practitioners build their skills and share best practice in connecting people to urban nature. The most important thing to remember is that the more you do outdoor learning, the easier it gets. And the benefits for young people – and their teachers – abound.